(NaturalNews) A top scientist and "risk engineering" expert is now publicly warning that GMOs pose a dire, genuine threat to the continuation of life on Earth. Nassim Taleb, author of The Black Swan and Fooled by Randomness, says that GMOs have the potential to cause "an irreversible termination of life at some scale, which could be the planet." In fact, as Taleb convincingly argues, genetically engineered crops are specifically designed to have a survival advantage over conventional crops, allowing them to better resist droughts or infestations of pests or weeds. This survival advantage -- if it's as real as seed manipulators claim -- means genetically engineered plants can out-compete non-GMO crops in open fields. The genetic pollution which is already underway across North America will only get worse, therefore, and there's no reversing it because all living systems -- even genetically engineered ones -- have a natural drive to spread, multiply and survive. - The Irish Potato Famine of 1845-1852 was caused by over-reliance on a genetically narrow food crop. Shockingly, one-third of the Irish population relied on a single crop, and when potato blight (a fungal microorganism) successfully attacked the crop, over one million people died from starvation. - The current crisis in world banana production is caused because nearly all commercial banana trees are genetically identical clones. - The near-collapse of Florida citrus due to disease is also caused by a striking lack of genetic diversity across citrus orchards. This principle is irrefutable and widely recognized as truth among nearly all scientifically-literate thinkers... except those pushing GMOs, of course. Those denialists selectively edit "scientific truth" to exclude any concerns that might question the wisdom of displacing the world's treasure of seed diversity with corporate-patented seeds. The Precautionary Principle is gladly thrown out the window when corporate profits are to be realized from doing so. Beyond the loss of genetic diversity, Taleb is also concerned about the possibility of catastrophic transgenic effects which could somehow weaken the world's food crops in ways human scientists never intended or anticipated. Murphy's Law -- which states that if something can go wrong, it will -- is widely recognized as a frustrating truth across physics, medicine, computer science and space exploration. Yet it is magically and irrationally declared null and void only for GMOs, where the roll of the dice quite literally threatens the sustainability of future life on our planet. As Taleb also explains in his paper, the cost of losing is so great that even tiny odds of failure may not be acceptable. After all, we're talking about the entire future of life on our planet. Self-replicating pollution is the worst class of pollution, far exceeding even the risk of nuclear accidents wiping out humankind. "As humans, we are ill equipped to understand the mathematics behind such risks," writes Taleb. And he's correct: human brains are not hard-wired to fully grasp the long-term implications of self-replicating pollution. In the same way, most people are utterly incapable of accurately imagining the long-term outcomes of compounded interest -- a phenomenon which eerily reflects the spread of self-replicating pollution. 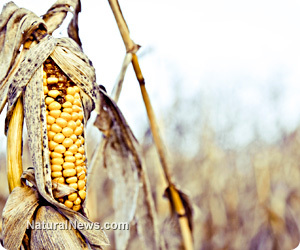 Imagine the global collapse of all GM corn crops. Or imagine the collapse of global soy production. Every crop which is GMO has some risk of being wiped out in a catastrophic manner caused by the un-natural manipulation of the crop's genetic code. The history of scientific advancement, of course, is rife with huge failures to foresee unintended consequences. Perhaps the most important example of that is found in the current rise of superbugs across modern hospitals. Utterly unforeseen by the world's top scientists and pharmacological researchers, superbugs have now risen to such prominence in our health care system that even the CDC has warned that the age of antibiotics is over. Superbugs, in fact, were a product of antibiotics. As drug companies churned out the drugs to "beat disease" -- and doctors prescribed those drugs to hundreds of millions of patients worldwide -- the perfect environment was created for the nurture and spread of antibiotic-resistant superbugs, many of which are fatal to patients. I personally knew three people who were killed in U.S. hospitals by superbug infections. Superbugs are the new death pandemic in America, and they are currently killing 48,000 Americans each year. They were unleashed by scientists who had no intention of causing death and destruction. Rather, those scientists working on antibiotics genuinely believed they were saving lives with no downside. At first, it all seemed true -- antibiotics inarguably saved many lives early on. But now, antibiotics are in fact the reason why deadly superbugs have escaped the reach of modern medicine and genuinely threaten the human race with incurable infections. Just because you wish for GMOs to "feed the world" does not mean they will. In fact, positive intentions can and do frequently blind scientists to the downsides of their own innovations. In example after example, scientists who believed they were pursuing technology for the betterment of humankind ended up inadvertently contributing to mass death and destruction. In a very real sense, most human beings are cognitively incapable of participating in any rational discussion of these issues. This includes most scientists, by the way, who are themselves just as vulnerable to peer influences and false mythologies as anyone else. In the name of "science," far too many scientists today merely embarrass themselves by pushing obscenely silly arguments in defense of GMOs, claiming utterly stupid things like, "humans have tinkered with the genetic code of plants for thousands of years. Genetic engineering is no different." Top-down modifications to the system (through GMOs) are categorically and statistically different from bottom up ones (regular farming, progressive tinkering with crops, etc.) There is no comparison between the tinkering of selective breeding and the top-down engineering of taking a gene from an organism and putting it into another. Saying that such a product is natural misses the statistical process by which things become "natural." The next idiotic argument put forth by desperate prostitute-scientists is that GMOs aren't dangerous because there's no evidence they are dangerous. As stupid as this sounds, it is also the faith-based argument of the chemical industry which insists "all chemicals are safe until such time as they are proven dangerous." If this bass-awkwards logic sounds familiar, it's because it is also invoked by the processed food industry in claiming that all food additives, preservatives and chemicals are inherently safe unless and until they are proven dangerous. What all this non-logic has in common is an illogical presumption of safety. This has always been the argument of the mass poisoners of our world. Regardless of the poison being discussed -- BPA, mercury fillings, pesticide chemicals, DDT, toxic heavy metals, triclosan, MSG and more -- its corporate backers have consistently and predictably hired swaths of prostitute-scientists to declare the substance to be "safe until proven otherwise." This presumption of safety sooner or later ends very badly. For over a hundred years, the heavy metals pesticide lead arsenate was "presumed safe." Made primarily of lead and arsenic, it was indeed very effective at killing pests that threatened food crops. So farmers across North America and around the world sprayed it on their food crops, producing amazing quantities of food... at first, anyway. Before long, the lead and arsenic bio-accumulated in agricultural soils, poisoning the trees that produced the food as well as the customers who ate it. To this day, soils across the world remain heavily poisoned by these deadly heavy metals, which is one of the reasons why so many superfood products sold today contain such high levels of heavy metals (see the Natural News Forensic Food Lab results for examples). Lead arsenate -- just like GMOs -- was "presumed safe" because it didn't cause immediate death to anyone. According to corporate-sponsored prostitute-scientists, anything that doesn't kill you within seconds is automatically presumed to be safe. All long-term implications of the chemical or technology are willfully swept under the rug and ignored. Corporations lean on government regulators until the cover-up becomes policy. At that point, both government and industry become active collaborators in the mass poisoning of the human race. And that's the whole point of my breakthrough article, The Battle For Humanity is Nearly Lost which covers this collusion in more detail. So in one sense, I only write this out of a fondness for galactic amusement, not out of any real hope that humanity can save itself from destruction via heavy metals, synthetic chemicals, pharmaceuticals and GMOs. But on the off chance that I am wrong in my prediction of humanity's demise, if we are to survive as a species, such survival will necessitate the global embracing of the Precautionary Principle across all realms of science and technology. Because even if we halt Monsanto and agree to have all the criminal biotechnology scientists halted from committing ecocide, we are all very likely going to be overrun by artificial intelligence before the year 2050, regardless of what else happens in agriculture or synthetic chemicals. Just as with GMOs, today's most brilliant computer scientists are wholly incapable of understanding the long-term implications of the race for conscious machines and advanced AI tech. The result will almost certainly be that humans will invent the technologies that destroy humanity, and we will all go down in history as the race of sentient beings who were smart enough to invent amazing technologies but too stupid to restrain them.